My favourite hobby is baking cakes. 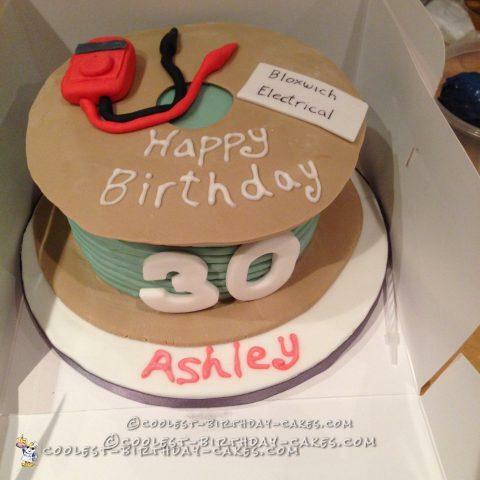 It was to be my son’s friends 30th birthday he works for my son at his electrical business, well I decided to make him a cake that looks like a drum of cable as last time I made him a football cake and wanted to do something different and also I wanted to make something I’d never done before too. I baked an 8” round cake in vanilla sponge and when it was cold I filled with jam and butter cream, I then covered the whole cake in butter cream and placed in the freezer to chill. Meanwhile I covered the cake board in white fondant, I then coloured some fondant in brown and cut out a circle bigger than the cake to represent the drum I added some gum paste to some more of the brown fondant just enough to cut out another circle the same size as the other and then I cut a circle out of the centre of it then this was left to harden for a few days this is to be attached to the top of the cake later. I now rolled out some grey fondant to represent the cable then I covered the cake and pressed the shape to form the cable around the side of the cake and set aside for a few hours before moving onto the cake board once moved I pipe iced his name onto the board. I now cut out the numbers 3 and 0 and set aside to harden and then made a electrical testing meter and a business card with the company’s name on it. I now placed the brown circle I had made a few days ago onto the top of the cake making sure it had hardened because it needed to support itself and then attached the testing meter and business card to the top of the cake I then attached the numbers to the front of the cake and to finish off I pipe iced happy birthday. His friends and family all went out for a meal and I sent the cake along with my son to surprise him.